Hey, I’ve got plenty of gaps where movie viewing is concerned, so I can’t opine too much on the subject. 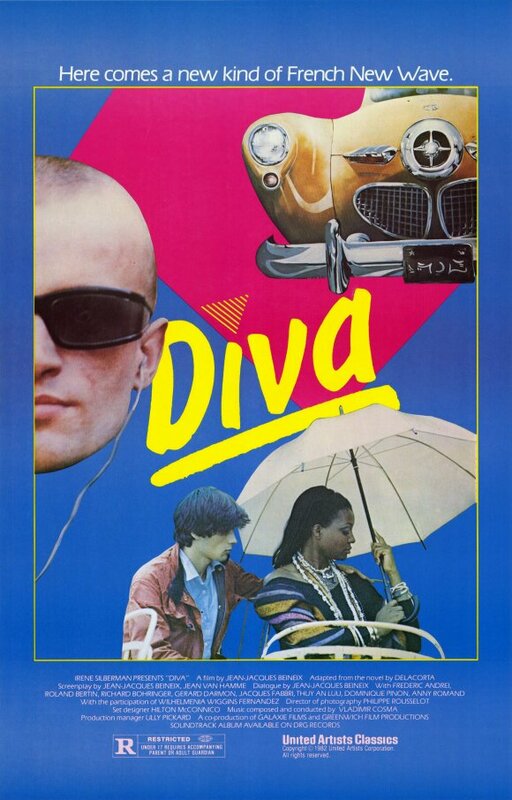 Still, I’ll go out on a limb and say that any film buff who hasn’t seen the iconic movie Diva (1981) should put it on their list. Do you think I should be more emphatic about this? How about if I give you the IMDB description? There. Maybe I’ve got Amb on board now, at least. Though Diva is usually listed as a “thriller” the label hardly seems to do it justice. What to call it instead? Existential pop fugue fantasia thriller romance? It is certainly one of the landmark movies of the 80s and continues to garner praise. It has also become a cult classic. And I’d wager that the chase scenes in Bourne Identity have a direct movie lineage with the scooter chase in Diva. Not to mention the “Diva Dance” scene in The Fifth Element, which is almost certainly cinematic homage. And that reminds me, the IMDB summary above fails to mention our title character, Diva herself. Diva is an electrifying singer with the dissapointingly bland name Cynthia Hawkins. But in a happy case of life not imitating art at all, the real life singer who plays the part has the spectacular handle Wilhelmenia Wiggins Fernandez. In the movie, Cynthia is a much sought after opera diva who refuses to be recorded. However, a very Amb-compatible young French postman opera buff manages to make a bootleg recording at one of her concerts. (He smuggles in a reel-to-reel in his mailbag.) That scene, with her brilliant aria, becomes the linchpin of the movie’s convoluted plot, as well as its ongoing motif. now lives in Lexington, Kentucky with her husband Met Opera baritone Andrew W. Smith and has sung in the major opera houses of the world but not at the Met. Her full name now is Wilhelmenia Fernandez Smith. Which isn’t nearly as impressive as Wilhelmenia Wiggins Fernandez. It should come as no surprise that the funniness of a funny name decreases inversely proportional to the addition of “Smith.” That observation might warrant inclusion as a corollary in Funny Names Theory but we shouldn’t be hasty: if “Wiggins” had been retained, “Smith” might have actually made it funnier. Plus, our sample size is too small. To wrap it up, let us salute both the movie and Wilhelmenia: Viva la Diva! Pingback: Wiggin Out on Wilhelmenia Mania! | What Do You Do for an Encore? Two shout outs, plus amazing 80s fashion and a cute young Frenchman just for me?!? Oh Diddz, baby, I’m on board whatever train you want. In a first class compartment. Full speed ahead. Train innuendos? Wow, I totally missed those. You mean like Thomas? Thomas the Train Engine? Hey, you just keep reading Austen, and I’ll keep pimping you the French dudes. If Amb keeps going with these suggestive train innuendos you’re going to need a pantograph. Diva continues to move up my netflix queue since you recommended a while back. Glad to have some character background. That is indeed quite a name. Seems you’re finding them everywhere these days 😉 Three cheers for diddy! Thanks, Liz! Those Netflix queues seem glacial. Would love to hear what you think of Diva! Diva, I loved Diva! What a great movie. I haven’t seen it in years. I’ll have to watch it again soon. Another Diva viewer! Thanks for the comment! i think it sounds great, and interesting they gave wwf’s character such a bland name. I was wondering about that, too! It’s like her real name was too improbable for fiction. Wilhelmenia Wiggins is a top tier name. It belongs right up there on top of the great Kajagoogoo mountain of Funny Names, where the famed Golden Horsey statue sits. I gotta see this movie. Yes,it totally is and totally does belong up there! And I’m surprised you haven’t seen the movie, since you’re such a movie buff. Perhaps we should set up a viewing party one of these days! And we’ve got to hear your report. Thanks for the comment, gfc! Reciprocity of linking is good things, and even worth parsing grammar of sentence! We salute if anything.